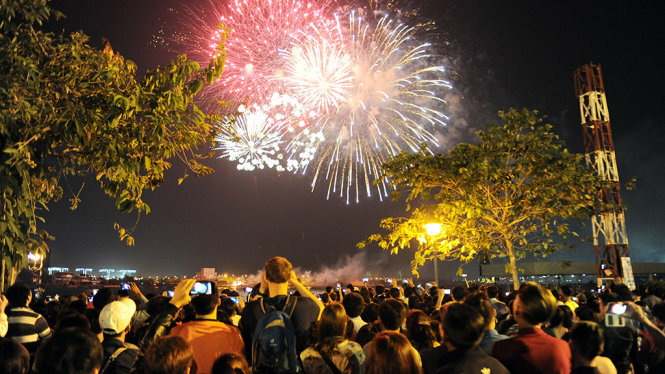 Authorities in Ho Chi Minh City are seeking permission from the central government to organize fireworks shows in celebration of the upcoming New Year and Lunar New Year. The municipal People’s Committee has submitted a document to the prime minister to secure his approval for pyrotechnic displays for the special occasions, which will be funded by the private sector. According to the proposal, a high-range pyrotechnic exhibition will take place in District 2 near the Thu Thiem Tunnel on New Year’s Eve. Three low-range performances will be given at the Dam Sen Park in District 11, Cu Chi Tunnels in the namesake district, and Rung Sac Square in Can Gio District. A similar plan is also proposed for the Lunar New Year’s Eve, which will fall on the night of February 15, along with two extra low-range fireworks shows in the Nga Ba Giong Memorial in Hoc Mon District and a location in Nha Be District. The performances will start at midnight and last for 15 minutes. The southern metropolis often holds fireworks displays to mark important events, including New Year’s Eve, Lunar New Year’s Eve, Reunification Day (April 30), and National Day (September 2). However, no show was organized throughout 2017 pursuant to an order from the Secretariat of the Party Central Committee, which requested that funds earmarked for pyrotechnic shows be used to support the poor. On December 24, the Secretariat issued a document stating that the country’s municipalities are allowed to organize pyrotechnic shows during the Lunar New Year (Tet) holiday. Expenditures for the shows must be commensurate with the conditions of each locality and must not be funded by the state budget, the Secretariat said. Public workers in Vietnam are given three days off in a row, from December 30, 2017 to January 1, 2018 to enjoy the New Year holiday. A range of public activities will take place across Ho Chi Minh City on the evening of December 31 to celebrate the transition into 2018.